Everyone knows there's a lot of content in Skyrim, so cataloguing all of it is going to take a pretty big book. How big, you ask? Big enough that the folks at Prima made an infographic just to tell you. The Prima Game Guide spans 1,100 pages for a total of 785,000 words. For the record, that's longer than the entire Lord of the Rings trilogy. The hardcover edition of the guide weighs in at six pounds, so you definitely don't want this one falling onto your toes. The secrets held within are the results of over 3,000 hours of "study" by Prima's experts. I feel like I know Skyrim pretty well, but these guys have logged a few more hours into the game than I have. Their wisdom will guide you through the 350+ quests of Skyrim and its expansions, and those who don't care much for literature can enjoy the guide's 4,000 full-color screenshots. At that point, budget gamers could probably get the full experience just by reading through the guide, avoiding the need to spend money on accessories like the actual game. 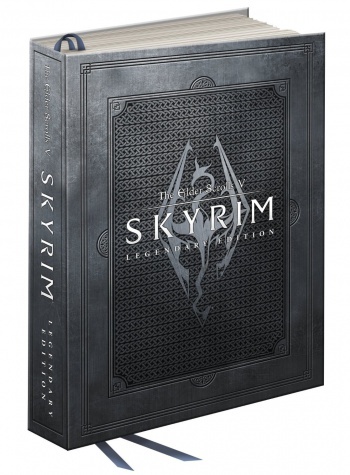 Skyrim: Legendary Edition is the compulsory rerelease of the 2011 game with all the DLC in one package. The new Prima guide will be sold alongside the Legendary Edition at GameStop, Amazon, and Best Buy. The tome comes in two flavors: the paperback print will set you back $30, while the hardcover Collector's Edition includes a 24-inch poster of Alduin's Wall and comes with classy ribbon bookmarks, sold for $50.